1. How low quality scores kill your advertising. 2. How to increase quality score with seductive ads. 3. How to keep high quality scores. 4. Starting with high quality scores in the first place. This is article was first published on CertifiedKnowledge as a guest blog post. Above 7 it’s in great shape. From 6 to 4 it gets weak. And at a 1/10 quality score, your keyword is dead. A craftsman uses his hands to do the labour and without them he cannot make a living. He trains them, makes them stronger and hones his skill… but if he ever gets a heart attack those hands are useless. The same is true in Adwords. Your landing pages and products make you money, you can tweak things here and there, optimize continuously but if your quality scores drop low enough… all advertising become meaningless. You’ve just had a heart attack. 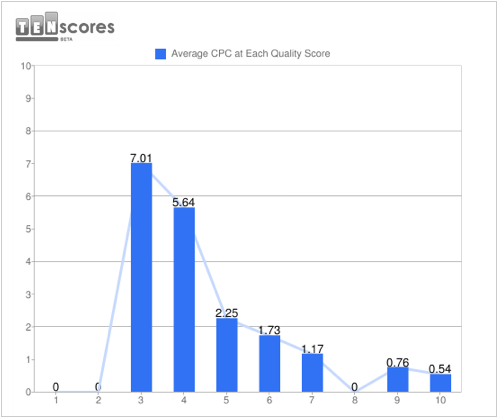 Quality score is the heart of every Adwords account. It defines how much search share you get and how much you pay for it. The differences in costs between one score level to the other can double, triple, quadruple and even be ten times higher at the lower end of the scale. Notice how first page bids double from 7 to 6, then from 5 to 4 and how they quadruple from 3 to 2. If you’re a math geek too, you surely have already reverse engineered the formula for first page minimum bid and you know that it is minBid = minAdRank / QS which is a simple rational function thus the shape of the resulting curve. And… the only purpose of that last sentence was to make me sound clever. Notice how the price doubles from a 10/10 quality score to a 7/10. And 7 is considered to be a great score to have. Notice the sudden bump between 5 to 4. Could that mean the difference between profit and loss? Absolutely. Now imagine two advertisers in this same market advertising on the same keyword. One has a 10/10 and the other has 4/10. The chart above tells us that the advertiser with a 4 could be paying 10 times more that his competitor. Now imagine that the advertiser with a 4/10 is… well, you. Yes, right now you might be paying 10 times more than you should on those keywords you’ve neglected to optimize. Your keyword isn’t triggering ads to appear on google right now due to a low ad rank. 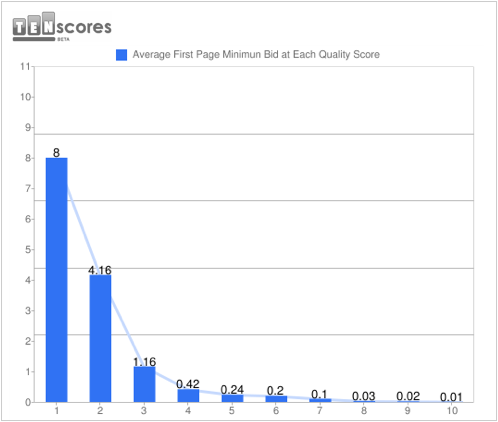 ads are ranked based on your bid and quality score. You can set up ads in 5 minutes and reach 1 million users with Adwords, right?! Well, it’s not that easy… and quality score will shatter your dreams of traffic orgies in an instant. Let’s talk about Impression Share (IS). Impression share depends on two things: Ad Rank and Budget. If you have a big budget to spend, obviously Google won’t really stop you from throwing money at them and if you want more Impression Share, just pay more. Increasing your Ad Rank, however, is the smarter way to go. Ad Rank – a (secret) number Google uses to rank ads in sponsored search results – influences Impression Share and itself is greatly influenced by quality score. It’s formula is AdRank = MaxCPC x QS. The higher your quality scores, the higher your Ad Rank, and the more impressions Google is willing to send your way. The lower your quality scores, the lower your Ad Rank, the less generous Google is with traffic. Every time your keywords’ scores drop, traffic is chocked, the pipeline gets thinner until ultimately the flow is completely clogged. I don’t know about you, but I hate paying more than I should and I despise getting less than I deserve. And that’s why I don’t ever settle for low scores — ever. It all boils down to relevance. Yes, we all know that click-through-rate (CTR) is the main factor that influences quality score. But what is behind a great CTR? It is having the most relevant ad shown to Mr Searcher. CTR is Google’s best measure of relevance. The importance of understanding relevance beyond what Google tells you is really crucial. The relevance I’m referring to has NOTHING to do with having the same keyword appear in the ad, the ad group or the landing page. It is about having a deep understanding of who the searcher behind the keyword is. Understanding what led him to typing those words in Google. Understanding his emotions, his frustrations and the short or long series of events that caused him to turn to a search engine for a solution. It’s about understanding what relevance means to him, NOT what it means to you. Only when you have that kind of understanding can you write an ad that instantly resonates with him and lift your click-through-rates. Once upon a time, in a distant land, an affiliate marketer decided to try the dating niche. One of the products he wanted to sell was a book about how to be better in bed – more specifically, the book claimed to have “500 Love Making Secrets”. The last recorded click ratio was 2.04%, the average cost-per-click was $0.21. Not too bad, wasn’t it? The quality score was 7/10 and it stayed at 7 for a very long time. But profits weren’t that good. He had no control over the website he was sending traffic to so landing page split-testing for better conversion rates was not an immediate solution. Click-through-rate jumped to 3.84%, quality score swelled up to 10/10 and the cost-per-click was cut in half: $0.10. Profits got better and he lived happily ever after. The successful ad wasn’t the result of looking at the website and trying to think up ways to write a better ad. It wasn’t born by trying out tricks like putting keywords in the title, adding a question mark or putting capital letters in the display url. It was born after intensive research on the person behind the keyword. I pictured myself being a man looking for love making tips. “What images would be flowing in my head, what do I secretly want, what experiences led me to this search and what is the ultimate result that I’m looking for?”, I asked myself. Then I typed the words in Google. I took a look at all the websites that were returned, and I asked myself why those results would be relevant and why some wouldn’t be. I looked into blog comments and forum threads to read what people on the same quest were saying about it and how they were expressing themselves. What I realized is that no man really wants to learn 500 love making secrets just for the sake of it. Instead, they want their partner to be the happiest woman alive and they want themselves to be the source of fulfillment a woman craves for. (And they want to witness her inner animal – grrrrrr!). This exercise can be done for any type of website, any type of offer, any type of product. Whatever it is you are selling, figuring out the deepest needs buried in the searchers mind will give you the competitive advantage you need to dominate your market. It will help you discover the features and benefits you need to put forward about your offer to align it with what searchers are looking for, resulting in above than average click-troughs and conversion rates. Type your chosen keyword in Google and look at the natural search results. Glance over the 10 results and find the general theme of the results. Are they mostly commercial in nature or are they informative. What are the words used and how, as a searcher, do you feel when looking at them. What are the ones that grab your attention? There’s a reason why Google is the number search engine, one of those reason is that they do a great job at showing searchers what they want. Researching the natural search results helps you understand better what is happening in the mind of a searcher. Google has already done half the job for you. Visit each of the websites returned and try to understand why the first website is number 1, why the second is number 2 and so on. Take a look at what information is offered and understand how each is relevant to your quest – and if it isn’t, find out why it isn’t. Start thinking of ways each website could give you, as a searcher, the solution you desire in a better way. Find blogs or forum related to you keyword. Read what people are saying about it. Learn how they express themselves, how they talk about the subject. Find out their knowledge level on the topic. Figure out what they want, what questions aren’t answered and what solution would make their lives easier. Amazon reviews of a similar product as yours is a great place to start. Now look at the sponsored results. You could use a spying tool that tells you how long each ad has been showing for your particular keyword. This will tell you – just like the natural search result – what searchers are really looking for. Your competitors have done the other half of the work for you so you should piggy back on their efforts and do a better job than them. Step 6 – Write The Perfect Ad! Write 2 or 3 ads to test with what you’ve discovered. It should now be clear to you what type of message resonates most with your prospect. If you’ve taken notes during your research phase in the previous 5 steps, that will help. Don’t takes these steps lightly. Take your time. Sometimes it takes me days to understand exactly what message resonates with a particular searcher. What’s great about it is that once it works for one keyword, it will work for most of the other keywords in the same market. When you have done the above exercise, you will know who is behind your keywords and what they are looking for. You’ll be able to segment your ad groups according to your ads and searchers desires. You’ll be able to fine tune your campaign settings to target the right person for the message you’ve written. Your ads will be sharper, Google will be happy and your wallet will feel it. Of course there’s more to it and there are other little ways to tweak ads for higher CTR. But there’s nothing I have found that improves ad efficiency better than deeply understanding who you are marketing to. Understand That QS Varies — A Lot! The graph above shows the quality score evolution of one of our keyword over a period of 23 days. The blue line represents quality scores progress and the green line represents first page minimum bids evolution, both having their numerical values displayed in the table below the chart. Notice how QS has been jumping from 4 to to 7 to 10 and back to 4. There are many reasons you may wake up one day and find that costs have doubled for your main keywords due to a decrease in quality scores. Knowing the main causes of quality score rise and fall will help you react fast when it happens. When testing new ads, bad ads can have nefarious influence on your keyword’s average CTR. 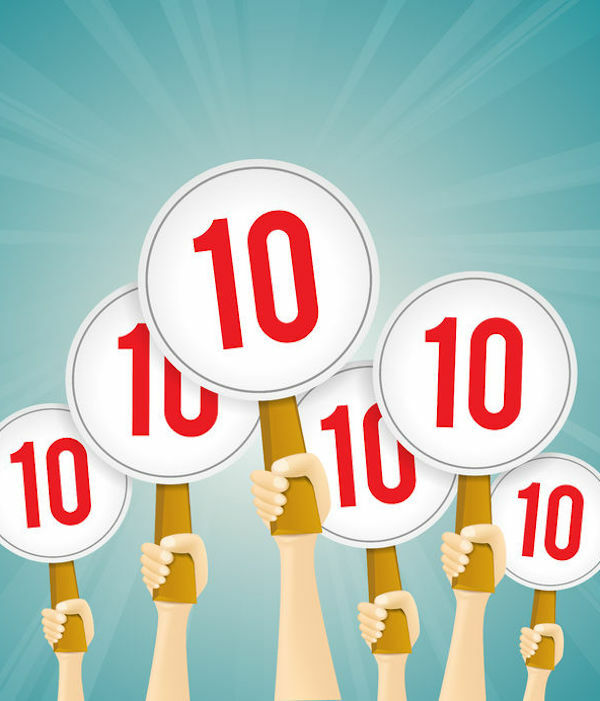 Your quality score will drop even when one of your ad is performing very well. That’s why it is sometimes a good idea to have one test ad being tested against 3 copies of the successful ad in one ad group. This ensures that your average CTR doesn’t drop too much due a bad test. The competition for your keywords may suddenly start performing better. Google compares your CTR to the average CTR being achieved in your market. You get rewarded for performing better than your competitors, you get punished for under performing. If your competitors suddenly start showing more relevant ads to your poll of prospects, and if that goes on for a while, your quality score will drop since you’re no longer on top of performance. Keep an eye on what others are doing, and try their ideas on your ads. You keywords may change meaning. It’s not uncommon. In his AdWords book, Brad gives an example with the word “Bleach” which shows results for a cartoon. Before that cartoon existed, you would have probably found results for the detergent. There was also a time when typing the words “make the cut” in google would show results of movies and amazon books. Today it mostly shows results for a scrap booking software that was created about a year ago. This all means that your keywords may suddenly start attracting searchers that have no interest in what you’re offering due to a change in keyword meaning. Keep a special eye on what your broad and phrase match keywords are triggering, make sure they stay relevant to your ads. Forgotten to renew your domain name? Or did you remember to check that the new landing page was actually uploaded correctly? Or maybe you work in a large organization in which different people work on the same set of pages. Working on a website can sometimes lead to errors not caught in time. When spiders come for a visit and find nothing, you get slapped with 1/10 quality score — a heart attack. Make sure your landing pages are always available and crawlable. The fact is: quality score varies and it can vary a lot. Those variations may mean the difference between good ROI and great ROI. They may mean the difference between profits and losses. So whenever you think you don’t need to keep an eye on quality scores, you’re doing a disservice to your wallet (and making Google richer). Oops, quality score did it again! Having a system in place for tracking your daily scores and being notified of changes will prevent drops from sneaking up on you with serious consequences. That’s one of the reasons why we developed TenScores, which is a web platform that automatically tracks quality score changes of an entire adwords account. (It is still in beta and we open doors infrequently, please sign up here to be notified next time we’re open). A free way to do it is with Excel sheets. I really like this little quick guide Jacqueline Dooley put together, in it she explains how her excel sheet shows her at a glance where she’s lost quality score points. If I didn’t have TenScores, I would personally use her method weekly – instead of monthly like she advises – on all my main keywords until they are all above 7. People who are searching for your brand’s name, your domain name or product name aren’t shopping around, they want you and they know it. The CTR you achieve from those keywords sets a foundation for your accounts history that influences the scores you receive for other keywords. Start in first gear and shift gradually. Before you go in and load millions of keywords and ads in your account, start small and test the waters with a few ad groups. Although the searcher behind every keyword is different, people in your market place share common frustrations or needs that need to be met. Use the tips mentioned above to figure out the kind of message that resonates most with prospects in your market. Once you have found the kind of message that generates above average CTR, it’s ok to scale and use the same message on millions of keywords if they fall under the same kind of market and same demographics. A common mistake that many new advertisers make is to start in 5th gear with too many keywords without having a deep understanding of what their market responds to. They end up having poor performance in a short amount of time, quality scores drop and the account is almost doomed to failure. Don’t make that mistake. I hope this helps you get closer to achieving your goals, let us know what you think in the comments.